It may surprise many people to learn that there are different views of the atonement of Jesus Christ. The most popular view, Penal substitution, is a distinctively Protestant understanding and it differs from both the Roman Catholic and Eastern Orthodox understandings of the atonement. There is great debate as to if any of the Church fathers supported this view. However, many can trace its origin to Calvin, but it was more concretely formulated by the Reformed theologian Charles Hodge in the 18th Century. While I do not necessarily agree with many aspects of Penal substitution, I do recognize Jesus Christ as being sent to the Jews first, and his role as the Lamb of God under the Jewish Law. While I do not agree that the sacrifice was to appease God in anyway, I do believe the Sacrifice was to satisfy the demands of the Law that the Jews lived under, that it may be fulfilled. Galatians 4:4-5 But when the fullness of the time was come, God sent forth his Son, made of a woman, made under the law, to redeem them that were under the law, that we might receive the adoption of sons. In my years of study, I have since come to understand and promote the “Christus Victor” view of the atonement. The “Christus Victor” view is more aligned with the Roman and Eastern Churches. It views the work of Jesus Christ as destroying the powers of Sin and Death, resulting in the permanent union between mankind and God and leading to the restoration of all things. Many have coined this as the “Undoing of Adam” atonement. 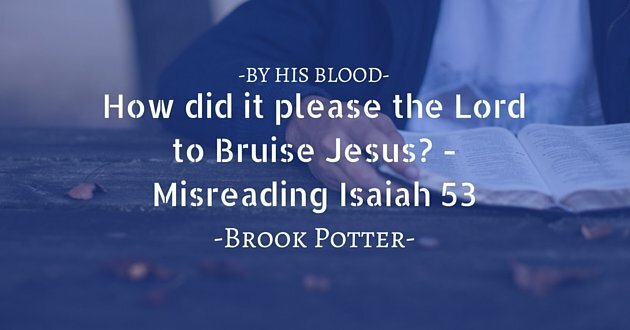 The number one reason people object to the “Christus Victor” view of the Atonement, is because of a misunderstanding about a messianic prophecy recorded in Isaiah 53. Two verses in particular that has led many people to assume that God poured out his wrath upon the Son, in support of Penal Substitution. The first verse is Isaiah 53:4 Surely he hath borne our griefs, and carried our sorrows: yet we did esteem him stricken, smitten of God, and afflicted. This verse shows what is really going on, as compared to how we thought it was going on. We believed he was being punished by God(verse 4), but the truth was, through this work that looked like punishment, there was actually healing taking place (verse5). The other verse in question is Isaiah 53:10 Yet it pleased the LORD to bruise him; he hath put him to grief: when thou shalt make his soul an offering for sin, he shall see his seed, he shall prolong his days, and the pleasure of the LORD shall prosper in his hand. This verse doesn’t say anything about God actually doing any punishment or bruising, it says God bruised Jesus by putting him to grief. In other words, the way Jesus was put to grief was by allowing humanity to beat and afflict his Son! Allowing Jesus Christ to suffer under the full weight of mankind’s sinfulness and rebellion, even unto death by our hands, is how God put Jesus to grief. What happened as a result of that decision by God, ultimately resulted in the fulfillment of God’s plan to redeem the creation, and that was pleasing in God’s sight. While at first glance these verses appear to be in support of Penal Substitution, they can just as easily be interpreted in another way that allows for the support of the Christus Victor view. While these are not the only two views on the atonement, these are two most popular. Whatever view of the atonement we decide to believe, will lead each of us to a different view of the Father, and the nature of how we relate to him and each other. If God put his son in harms way then he is a celestial child abuser so your interpretation doesn’t present god in any more favourable light. And if an omnipotent being had to allow punishment as atonement then he couldn’t have been very omnipotent. For to be all- powerful one would have an infinite number of tools in the toolbox to effect reconciliation. God, being able to do anything could (and surely would) have found a better way, –one which accorded with his job description of omni-benevolent. ?? Hey Gary, thanks for the comment. If what you had said was actually what was taking place in the atonement, I’d agree with you. But Penal substitution atonement is exactly what I’m arguing against, and I do not share your understanding of what the Cross was about or what it accomplished. There are two problems with your first premise about the Father putting the Son into harms way as being Child Abuse. You wrongly assume that the only reason a person can be put into harms way, is solely for reasons of abuse. This is patently false. If you saw your father drowning, then decided to dive into the water to rescue your father, you would be putting yourself in harms way, not for any reason to do with abuse, but because of love for your father. Even if in so doing, you happened to drown in the process, no one would in their right mind would turn around and say that the drowning to save your father was Child Abuse on the part of your father. That is very much the sentiment that we see of the Father Reflected in John 3:16, where the motivation to send the Son into harms way, was Love. Second, It would ONLY be child abuse, if it was done AGAINST the will of the Son. But we read that Jesus agonized over events before his Crucifixion, and willingly submitted to death. Luke 22:42 Saying, Father, if thou be willing, remove this cup from me: nevertheless not my will, but thine, be done. Now do not underestimate the power of those verses. Remember Jesus and the Father are in Union. Jesus is the Express Image of the Father, so the turmoil the Son was feeling, was also shared by the Father. Far from being an image of Child Abuse, it’s a picture of agonizing self sacrifice. At least, that’s how I understand these verses. To your second point. I don’t believe that the punishment was needed for any type of atonement, as I’m firmly against the Penal Substitution view. The Abuse afflicted on Jesus Christ, was done by men, for completely opposite reason. That when Mankind did their absolute worst, most blasphemous, sinful act possible, God responded by forgiving, adopting and blessing all of mankind. The Cross of Jesus Christ, was to reflect the true nature of God, which is, that when we were at our worst, God gave us his Best. So when Jesus said, “Father Forgive them.” He wasn’t asking God to do something against his nature. They are in Union, so the Father was in complete Agreement, and of Course he Forgave us. But this brings me to your last point. Could God have reconciled us in another way. Of Course! But can you think of another way that God could have shown his loving nature, apart from letting us do our absolute worst, and him responding with his absolute best? The Cross revealed what we got wrong about God all those years, that he was the kind of God that would rather die on a cross, at the hands of men, rather than punish sinners for what they have done. I put it this way. Good parents adopt Children, really loving parents may adopt a Child with a special need that requires more attention. But the Love of God was such that He adopted his enemies that hate him, after we killed his son, and then Blessed us with a full inheritance. If that doesn’t meet the requirements of benevolence, I don’t know what does. Now if you can come up with a better scenario that reveals that kind of Love that the Father has for us, I’d love to hear it. Dear Brook, I think you are a passable theologian but not much of a philosopher. Your comments are a bit short on logic. Firstly your drowning analogy shifts the context to where the father is a victim and the son, in an endeavour to assist, becomes an unwitting one. No abuse from either party. Next, I can think of a case where a child is brainwashed by his father to explode a suicide device. The child was completely happy to do so but the act by the father was child abuse plain and simple. So Jesus accepting his fate is irrelevant. You no doubt have heard of the Stockholm syndrome? Thirdly ‘Gods’ cannot die on the cross or anywhere else if they have a claim to the title ‘god’ under St. Anselm’s ontological proof, which incidentally, is the only premiss of the argument I favour. Lastly, why would an omni-benevolent god be obsessed with punishment? Remember he had already drowned a whole world population for a woman eating a a goddamn apple which he just happened to put in her way!!. Putting aside the logic of punishing the children of the children etc it is highly unethical for a god or anyone to punish patently innocent people. No Brook ,however you slice the cake your god is a mean god whom we should shun rather than praise. Gary I can see you’re obviously not following me here. The analogy about the Father drowning was not to parallel the atonement, rather to parallel how a father can put a child in harm’s way without it being cause for Abuse. You not recognizing that in no way dismantles the argument. If a Father brainwashed a child to blow up a suicide vest, that is most definitely child abuse, but the abuse is the BRAINWASHING. Because by nature it’s manipulation of a person’s will, that is abuse! Unless you’re suggesting that the Father Brainwashed the Son, this has no baring on the narrative. Stockholm syndrome again is a mental disorder, where a person feels attraction for their abuser, this does nothing to justify abuse against someone’s free will. Are you saying that Jesus suffered from Stockholm syndrome? Is that your position? This has nothing to do with anything. it’s a straw-man at best. While you are free to discount the fact that Jesus accepted his fate, that does nothing to deny the self sacrifice narrative and that he did so willingly, without compulsion, in his right mind and without any manipulation. But you are free to deny it, but I believe the ethos of a behavior is important, as it can been the difference between abuse and self sacrifice. If you have already decided to ONLY hold to Anselm’s understanding, then it is no wonder you disagree with someone from an Athanasian perspective. Again that doesn’t make your argument right, it just means you are not willing to entertain other positions. That’s fine, I trust the Christ in you, do what seems right in your sight. I don’t share your view, and I’m more flexible in my understanding, and in what I teach, but for me there is no conflict with concept of Jesus dying. My God is not obsessed with Punishment, as my God didn’t Punish Jesus. On the contrary, my view is that MAN is obsessed with Punishment, and MAN punished Jesus. In many ways, you are making my case for me, as you seem to be the one who sees everything in the old testament as punishment. You are free to read my other works on many of those incidents, as I don’t share your view, and neither do I believe they are taught in Scripture as Punishment. I appreciate your comments, you’re obviously very certain in the belief of the monster God, something I actually don’t believe in, I don’t see in Scripture and I’ve done a great deal of work to clear up. But the fact that you have come back with unrelated arguments, and no response to how God could have shown his benevolence better from what I’ve presented, I can see you’ve already made up your mind about who you think God is. So my advice is, Believe what you want. The monster God is not my God, I don’t see him in Scripture, and you have done little to dismantle my arguments for my positions. You say I don’t answer your questions but it seems that is the kettle calling the pot black. population? Did he order the Cannanite men killed and the women raped? Did he get annoyed with the survivors of the flood for seeing the Noah naked and pissed? Did he ask Abraham to sacrifice his son? Even if only one of those is correct my point is proved. And you ask ”how could God have shown his benevolence better’? I’ll tell you. He could have forgiven us without Jesus needing to die. That’s pretty obvious. There is nothing illogical about that and much that is benevolent. Much more benevolent in fact than requiring his son to die. But there are questions of mine you failed to address. Principally how is it ethical to hold children and children’s children guilty for the antecedent sins of the father? I.E those things that supposedly it was necessary for Jesus to be sacrificed for. Brook, that’s like a teenager’s ‘whatever’ when she gets put on the spot.. I really would like your answer to my last paragraph and expect ,if you have any other readers ,they would too. I wonder if was the benevolent God who said ‘spare the rod spoil the child’? He’s bloody obsessed with causing pain! The law of self-sacrificial Love trumps the law of sin and death!